It is my honor to announce that the Dandy 2016 Medal was awarded to Professor Albert L. Rhoton posthumously this past Saturday, November 12th. 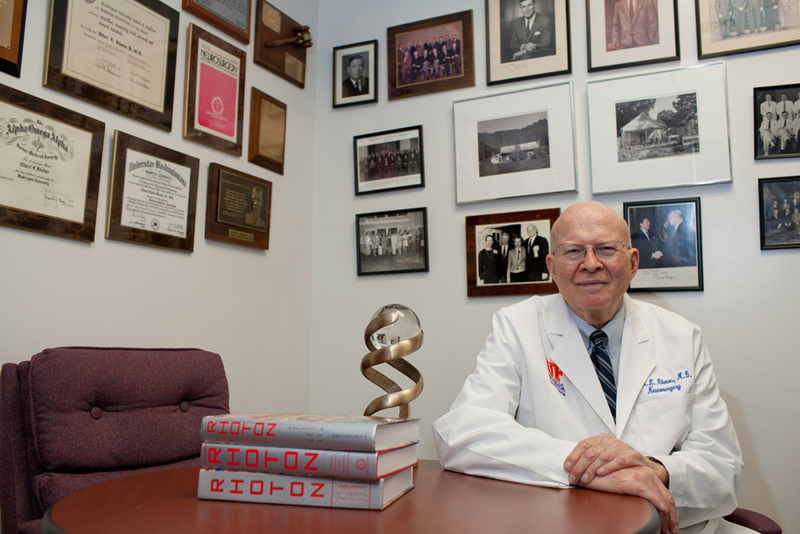 Dr. Eric Rhoton, neurosurgeon, officially accepted the medal on behalf of his late father. The ceremony took place during the 5th Annual Dandy Meeting, Santa Monica, CA, USA. 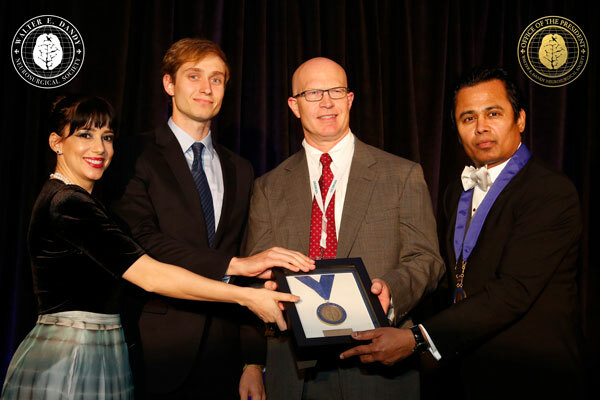 Dandy President, Saleem I. Abdulrauf MD, and Secretary, Tatiana Vilasboas MD, awarding the medal to Dr. Eric Rhoton (son) and Alexander Vlasak (grandson). The Dandy Medal is the highest honor the society bestows. Prof. Ghaus Malik (USA) received the 2015 medal. 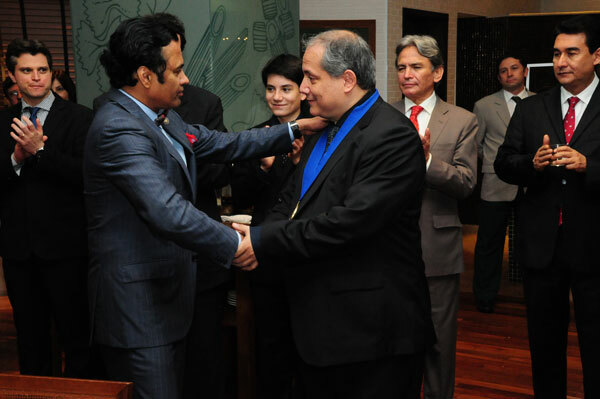 (Pictured: Prof. Abdulrauf (USA), Dandy President, awarding the medal and official Dandy Leadership pin). Dandy Board members, Profs. Herrera (Argentina), Dolenc (Slovenia), Broggi (Italy) conducted the official ceremony. Prof. Abdulrauf was introduced by Dr. Aneela Darbar. Pictured in the background is a photograph of the President’s father (Capt. Abdulrauf), a decorated pilot, who has been a key mentor for our President. The Presidential Address emphasized the integral issue of outcomes of patients undergoing neurosurgical procedures. 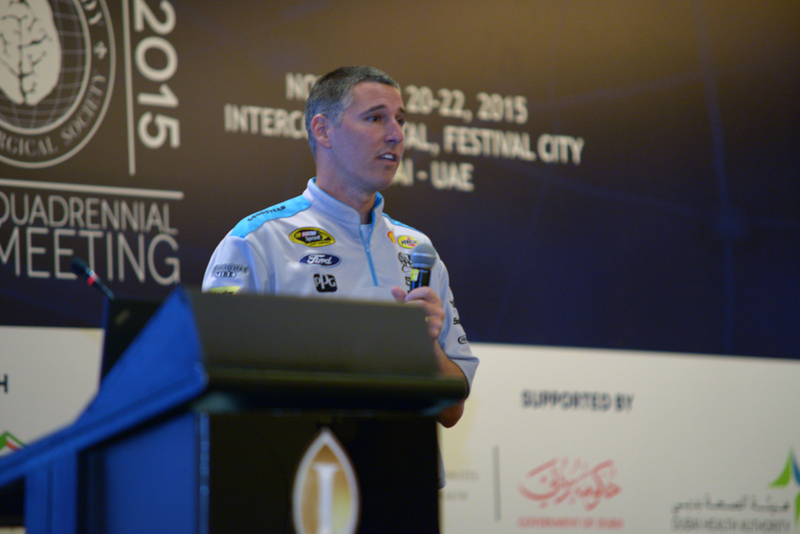 Trent Cherry, Head Pit Crew Coach, Team Penske, delivered an engaging presentation about challenges and team development in the car racing world. 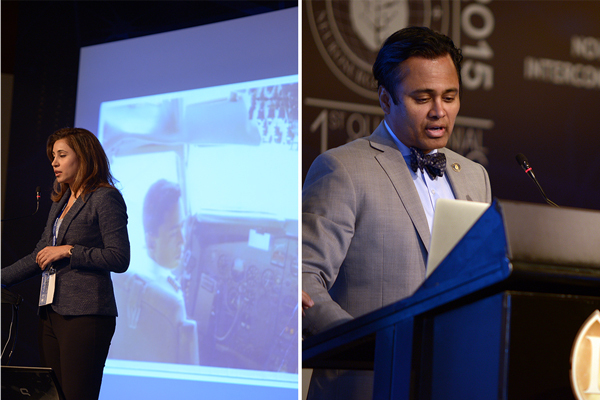 The panel discussion drew lessons for us in neurosurgery. Lt. 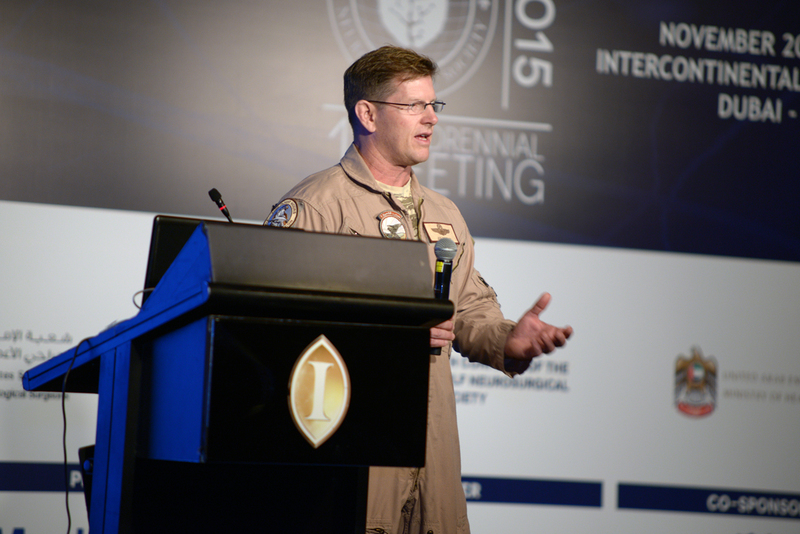 Colonel Joe “Hooter” Feheley, United States Air Force, delivered an engaging presentation on the lessons learned by fighter pilots and the importance of simulation. The panel drew comparisons to training in Neurosurgery. At the official Gala Dinner honoring Prof. Malik. This gives me the opportunity to acknowledge and thank our leadership (Profs. 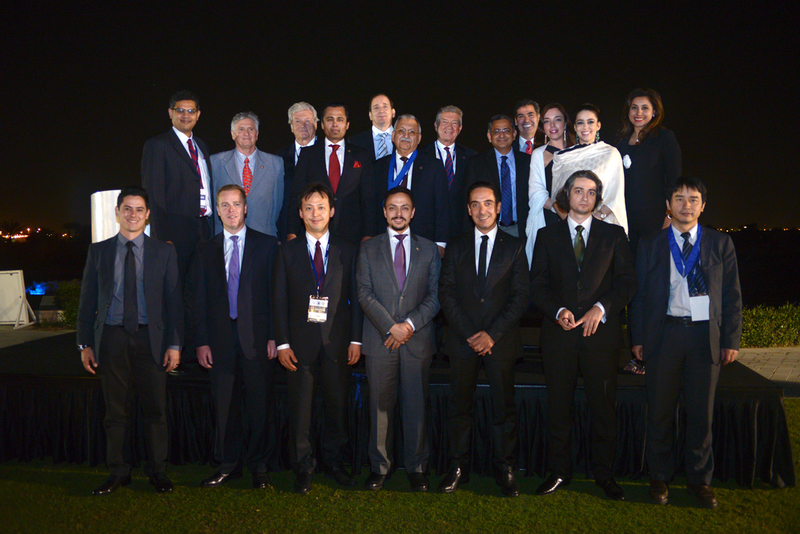 Abdulrauf, Herrera, Dolenc, Gonzalez-Llanos, Xiao) as well as the Scientific Program Committee (Drs. Coppens, Vilasboas, Alfayate, Darbar, Nery, Sabbagh, Grasso, Andrei). I would like to sincerely thank the Gulf and the Emirates Neurosurgical Societies, with special thanks to Dr. Mohamed Al-Olama, President of the Emirates Society, for his yeoman’s work in making this meeting a success. This was a unique neurosurgical meeting that addressed the concept of complications in a very open manner, with special sessions that allowed for lessons from outside our specialty and welcomed neurosurgeons’ spouses and families to be fully involved. This was a game changer! 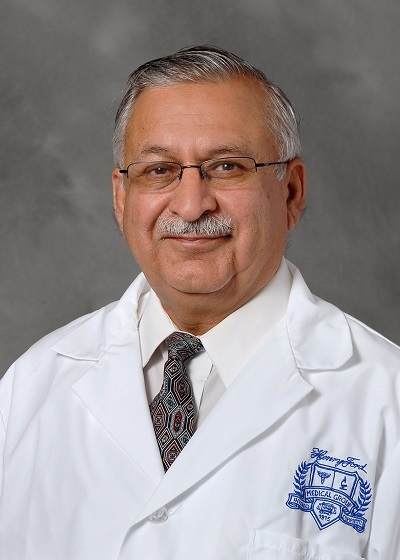 It is a sincere honor for me to announce that Professor Ghaus Malik has been selected by the Dandy Medal Nominating Committee as the official recipient of the 2015 medal. 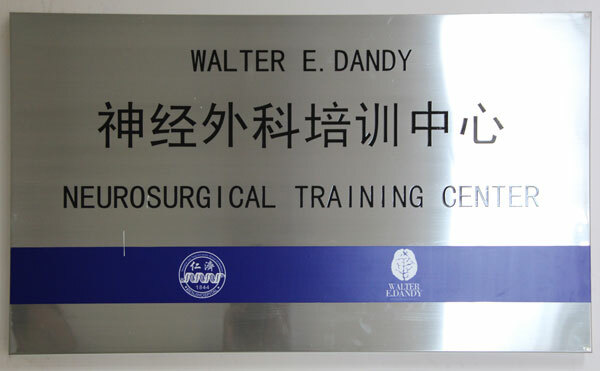 Has achieved mastery within a discipline of neurosurgery. Has produced seminal scholarly work within that discipline of neurosurgery. 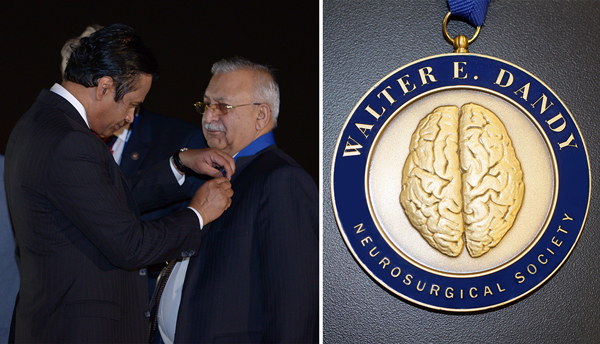 Has been a mentor to a whole generation of neurosurgeons. 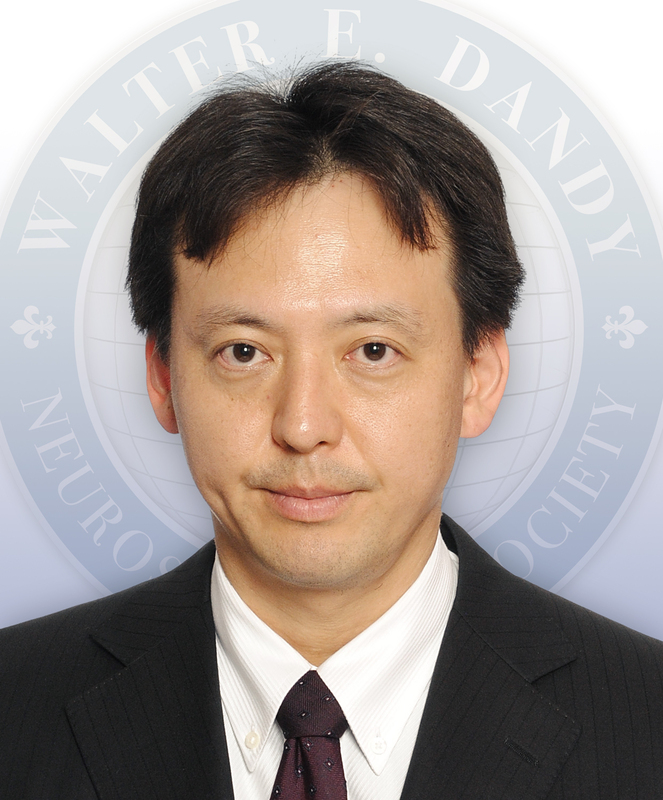 The Dandy Medal Nominating Committee receives nominations from neurosurgical societies and neurosurgeons worldwide. The chosen medalist’s mastery is based on attestations by his or her peers within said discipline. The Committee through review of the nominees’ publications judges pioneering scholarly work. The mentorship is substantiated by attestations made by the trainees of the nominee. 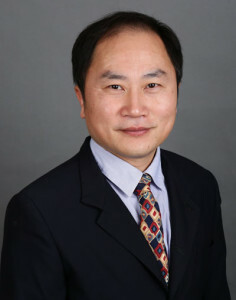 Professor Malik is an authority in cerebrovascular surgery and a recognized master in AVM surgery, in which he has one of the largest series in the world over the past 3 decades. His original work on AVMs has had an impact on the surgical treatment of these lesions. The testimonies of his former residents, who are currently in practice throughout the US, speak with deep respect and long lasting admiration that, to me, is the hallmark of those who truly guide our specialty. 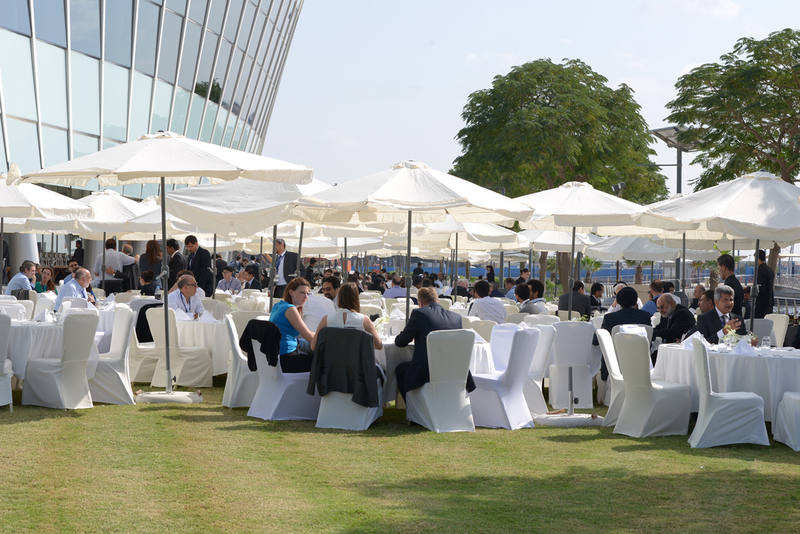 The official Medal Ceremony will be held at the Dandy 2015 Annual Meeting in Dubai on November 21st. The Dandy Medal is the highest honor the Society bestows upon a neurosurgeon. Professor Malik is a giant among men as well as a giant among neurosurgeons. L to R​, Professors Edson Mendes Nunes (Secretary of ABNC), Modesto Cerioni Junior (President of Brazilian Society of Neurosurgery), Marcos Maldaun (President of SNOLA & Vice President of XVI Congress of Brazilian Academy of Neurosurgery), Saleem Abdulrauf (President of the Dandy Society), Representative-Saulo Pedroso (Governor of Atibaia District), Paulo Henrique Pires de Aguiar (President of XVI Congress of Brazilian Academy of Neurosurgery), Edgardo Spagnuolo (President of FLANC), Jose Marcos Rotta (National Honorary President of XVI Congress of Brazilian Academy of Neurosurgery), Marcos Tatagiba (International Honorary President of XVI Congress of Brazilian Academy of Neurosurgery), and Jean de Oliveira (Representative of Neurosurgical Society of Sao Paulo). 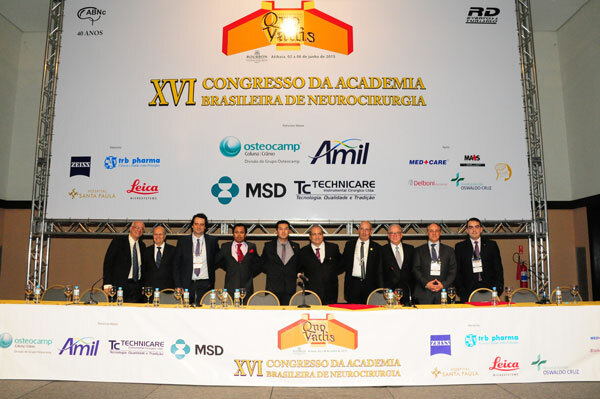 The inaugural Brazil Neurosurgery 101 was held at Universidade Nove de Julho (UNINOVE). 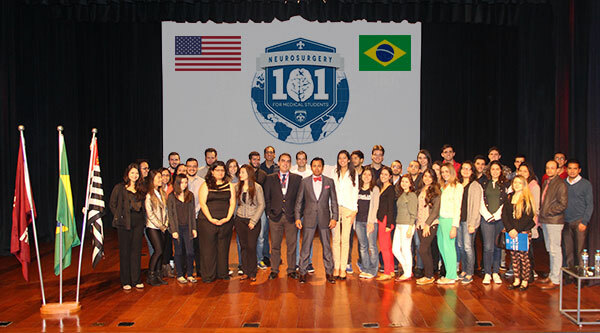 Pictured above Professors Abdulrauf (Dandy President) and de Oliveira (Dandy Brazil Chapter Secretary) with the first Brazil Neurosurgery 101 for medical students. May 31st, 2015. Professor Abdulrauf (Dandy President) with students from neurosurgery interest groups from throughout Brazil at the Universidade Sao Francisco in the state of Sao Paulo. June 1st, 2015. Professor Paulo Henrique Pires de Aguiar (President of the Brazilian Academy of Neurosurgery and President of the Brazilian Chapter of the Dandy Society) was awarded the 2015 Dandy South America Medal for Leaders in Education at the Joint Meeting held in Atibaia, Brazil. June 4th, 2015. 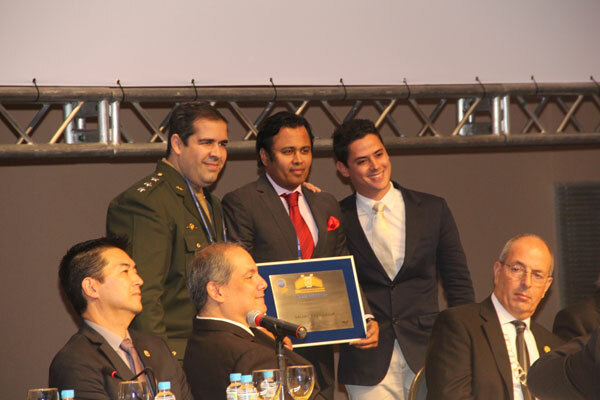 The medal was awarded at the official ceremony of the Brazilian Academy on June 3rd, 2015, Atibaia, Brazil. At the side of Prof. Abdulrauf (Dandy President), are two of Brazil’s upcoming exceptional neurosurgeons, Dr. Paulo Porto de Melo (right), Dr. Breno Nery (left), both have been mentored by the Dandy President. …Prof. Abdulrauf is an awesome doctor and was able to teach so much in such a short time. Im very happy to be part of the first Dandy 101 course in Brazil. Looking forward for the next one. I thought the course was amazing. To begin with, Prof. Abdulrauf not only gave an excellent class, but also motivated all students that were there to get to know Neurosurgery by knowing Neuroanatomy – which is fundamental. The interactive kind of class gave us the opportunity to think together and learn a lot more than the old-fashioned kind of class. I was very happy to be there and hope there are other courses in Brazil, maybe longer! It was an amazing experience. Usually there aren’t many courses regarding Neurosurgery in Brazil, especially with foreign teachers. Hearing a lecture in another language is really important to test your knowledge and your comprehension on a subject, considering you have to double your attention in order to understand everything. In other words, it was a very enriching experience and I’d like to repeat it, if possible. It was a very interesting 101 course and increased my knowledge about neurosurgery. It’s a complicated area of medicine and the physicians made it all so clear, I really enjoyed it. Very good. The course was great!! It taught us not only techinical aspects about medicine, but also gave us a whole new perspective of the neurosurgical specialty, both professionally and personally. We also had the opportunity of getting to know Prof. Abdulrauf, who got really interested in us and our projects. He was really “accessible”, and encouraged us on our path to neurosurgery and through medicine itself. The course was a contribution to my graduation. I enjoyed the way the content was exposed. 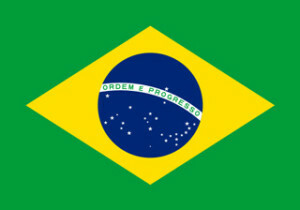 Would like more such events in Brazil. 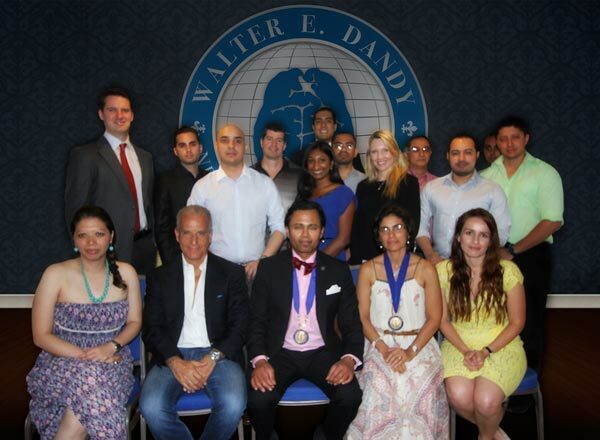 Professor Abdulrauf, Dandy President, along with participants of the Dandy Bulgaria Operative Techniques Symposium. Inauguration Ceremony of the Honduras Chapter. May 3, 2014. 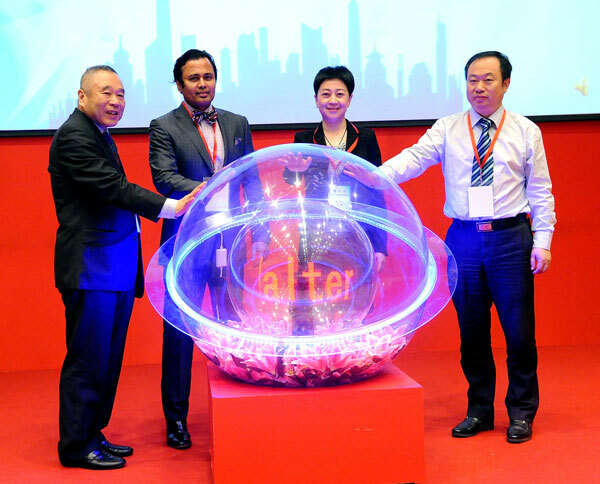 Dandy Global Officers and Dandy China Officers recognize Professor Xiaohua Zhang for his efforts in establishing the first Dandy Hands-On Training Laboratory in the Continent of Asia.